McCain's Northwest Air Campaign fund connections and legal counsel client ties prompt murder attempts upon my mother and I to silence online voice After speaking out on Jan 18/06 Northwest Air Profiling Attack upon us. Gov just downed our site at www.AaronJamesstory.com on Oct 6/08 to hide these ongoing attacks- We are fighting back for life preservation! Presidential candidate John McCain I have now discovered, is deeply connected to the persecution ongoing against my mother and I in the wake of the Jan 18/06 Minneapolis Northwest Airlines profiling attack upon my mother and I, via his close association with Northwest Airlines, the official airline of his political campaign and the fact that his lawyers have Northwest Airlines as one of their top two primary clients! !- a detail which I have just this second uncovered, the most profound aspect, bar none of our ordeal. The individuals in this chart are all current or former lobbyists who either serve as fundraisers for McCain's campaign or senior aides or advisers. There are currently 118 126 129 130 133 134 lobbyists working for or raising money for McCain's campaign. "1) If you've taken a flight on Northwest Airlines in August you may have noticed the full cover of their in-flight magazine, World Traveler, greets you with the trio of Norm Coleman, John McCain, and Tim Pawlenty(*exposed extremist/click) with the headline "The Republican's Are Coming!" The full-length photo identifies "Presidential candidate John McCain is flanked by Sen. Norm Coleman, R-Minn., and Minnesota Gov. Tim Pawlenty(click)." Meanwhile Barack Obama gets a less than two inch inset headshot photo which fails to mention that he is a senator, also a Presidential candidate, oh, yeah, and that his name is Barack Obama. 2) Then there's the message from NWA President & CEO Doug Steeland which reminds us that his airline is the official airline of the Republican convention. 3) Inside the magazine, the splashy feature article on the Republican convention includes the cover photo of the three men again along with brief descriptions of them, including "fun facts." 4) An article called "Denver: Eat, Sleep, Play," is more or or less a travel guide for the city, and includes a 4 inch photo of Obama captioned "Presumptive Democratic nominee Barack Obama." He gets no bio or "fun facts." So, my questions are basic: Why is John McCain a "Presidential candidate" and Barack Obama just a "Presumptive Democratic nominee?" Why is Obama uncaptioned on the cover? Why use the word "flanked" rather than "appears with" or just their names as in the second Obama photo. Why do the Republicans get bios and Obama nothing? Why is part of my NWA airfare going to support the Republican Party and John McCain? Corporate interests are at play here, and while I am a Canadian citizen with no political motivation in U.S. elections, I have observed McCain's bigoted extremist campaign strategy (Palan labeling Obama a consorter with terrorists and their supporters shouting "lynch him, kill him etc) along with video of McCain singing "bomb bomb Iran" and promising of "other wars to come"- a trillion dollar war based on a lie (Weapons of mass destruction) and oil/ drug trade/ war profiteering along "the silk road" of the middle east at the expense of millions of lives and U.S. soldiers. 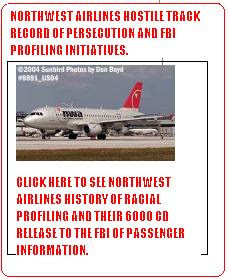 John McCain's extremism , in league with his World Traveler/Northwest Air splash ad caption with Tim Pawlenty, Pawlenty's campaign denounced as racially prejudicial and extremist,is consistent with the profiling mandate of Northwest Airlines and their ILLEGAL 6000 CD Passenger Name Record (PNR) (million's of names) release to the FBI developing the profiling system (CAPS-Computer assisted profiling system) targeting U.S. civilians. Article:Personal passenger information provided to the FBI and NASA by Northwest for Passenger Profiling Project-***they first denied this then admitted to their outright lies and this activity after such action was revealed externally. washingtonpost.com: "Northwest Airlines provided information on millions of passengers for a secret U.S. government air security project soon after the Sept. 11th terrorist attacks, raising fresh concerns among some privacy advocates about the airlines' use of confidential consumer data. The nation's fourth-largest carrier publicly asserted in September that it 'did not provide that type of information to anyone.' But Northwest acknowledged Friday it had already turned over three months of reservation data to the National Aeronautics and Space Administration's Ames Research Center by that point." So what you're saying is that Northwest out-and-out lied. Nice. You know - is it any wonder that people don't trust Big Anything anymore? posted by NL Staff at 22:35"
the McCain/Northwest Airlines backed political campaign. McCain’s corporate interests now exposed synonymous with Northwest further underscore and illuminate the covert attempts upon our lives associated with lobbying against this Corporation given the financial and political interests at large. McCain is known very well for his Freddie Mac Savings Investment and Loan scandal, Keating 5 Scandal in the 80's and his war mongering oil profiting mentality in the East, consistent with his desire to finance the oil moguel Exxon Oil with 4.3 billion in tax benefits as part of the bailout plan, and leave the middle class in the dust- I am a Canadian citizen and have no political motivations herein-this man and his co -consorters are coming after our very lives! We have stepped on some very corrupt and sinister corporate toes in lobbying now 3 years ongoing after Northwest Airlines- and DO NOTE: McCain's Northwest Air affiliated camaign began 1 year ago- the very date of the original Oct 27/07 kidnapping attempt/ lawless no warrant no charges raid of my home and attempted kidnapping! DEEPER IMPLICATIONS: make no mistake this is not just a race issue this AFFECTS ALL AMERICANS :- Operation Falcon *televised mass arrests of ALL citizens (white black -EVERYONE) operation TOP OFF 4 recently with large numbers of arrests, the extension of FISCA bill 2008 by Bush, RNC, do you see a pattern? . Go and see McCainsings.com and therealmccain.com - he is actually SINGING ABOUT BOMBING IRAN! So what? This iis how YOU will be directly affected: On May21/2007 Bush gave himself self imposed dictatorial powers to be used at his discretion during a "state of national emergency" which he could arbitrarily declare. War with Iran would suffice. Also, under the Security Commissions act and Bill HR1955 and 1949 YOU can be arbitrarily detained as an enemy combatant simply by professing ideology which is in contention with state agendas. RNC is just one poignant glaring example with much more and much worse yet to come. ALL AMERICANS MUST HERE OUR MESSAGE- WE ARE ALL AFFECTED. Martial Law is no longer a fantastic machination of our imagining but perhaps very close on the horizon if current trends hold. (*I WAS ATTACKED 48 HOURS LATER *IN CANADA by MN Police Affiliates-Winnipeg Police (http://winnipegpoliceexposed.blogspot.com) Wpg police acting on behalf of MN Factions. Our attorney Adam Masiowski Pinx Law 204 949 1700 ext 3. ***WPG POLICE TERRORIZE MY MOTHER AT HER HOME NEAR MIDNIGHT JAN 7 '08 AND BACK AT MY HOME JAN 26! Winnipeg Police are Criminally Charged in Separate Crimes! SAME POLICE involved in second attack upon us in Canada NOW CHARGED AND EXPOSED IN INDEPENDENT INVESTIGATION! 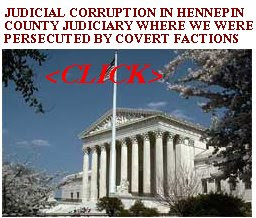 Our Judiciary Exposed as Entirely Corrupt http://imchennepincountyjudiciarycorruption.blogspot.com/ Hennepin County Targeting minorities victims of police brutality and the poor. UPDATES WHILE MY MOTHER AND I REMAIN UNDER SIEGE!! 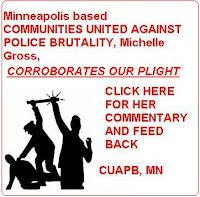 http://advocacymgrosscuapb.blogspot.com/ (she was attacked at the Minneapolis RNC Aug 29/08! I was attacked 51 hours later midnight on Aug31/08 via a kidnapping attempt-Minneapolis factions involved using Winnipeg ‘Police’ to act on their behalf. "It's no secret that the FBI started keeping close tabs on Minnesota's Somali community after 9/11… an ongoing monitoring of Minnesota's Somali community. The FBI has recently ratcheted up the number of impromptu interviews it is conducting with Somalis, often knocking on doors at night… The question now is whether Somali anxiety over such contacts will prevent some 5,000 eligible first-time voters from turning out to vote on November 2… "Someone came to my house and told my father that the government will find out who you voted for, and then take action against you," he recalls. "My father didn't sleep for a week.") 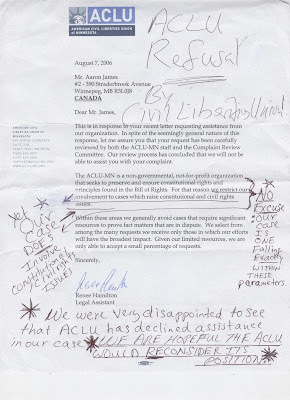 "
*Center For Human Rights Barbara Olshanks_Promises help-Then Refuses by Mail! John Graham, JOHN GRAHAM FACES EXTRADITION http://www.gnn.tv/headlines/14252/Delivering_Framed_John_Graham , BC COURT OF APPEAL BOWS DOWN TO FBI FRAME UP AND ALLOWS RCMP / FBI COLLUSION ABDUCTION OF JOHN GRAMAM- framed for killing another American Indian Movement member who the FBI killed!! -FBI assisted Government in usurping the lands of the Dakota Indians for their Uranium Ore mining to fuel weapons for the U.S. WAR MACHINE. , SEPT 17/08 (Winnipeg Police car 602), Oct 10/08 12:10pm Police in hallway again in large number emergency call to family to attend. Now 15 attempts total! Charles Guiliani talks with Aaron James about his harassment by the US government. HTTP://MCCAINATTACKS.BLOGSPOT.COM We are Under Attack- Government Are Attempting Our Murder- McCain and affiliates have reacted Violently to Our lobbying Against Northwest Airlines after My mother and I were profiled/accused of suspicious and ATTACKED on board a Northwest Airlines aircraft and left bloodied/ placed through FBI interrogation 9 days no Miranda etc and thereafter had FBI send threats of harm to come upon us referencing McCain. My mother was accused of having a suspicious bag only AFTER we had passed through security gates without issue and were already on board the aircraft-as entrapment –in retaliation for having served the airline a written complaint about the treatment of our baggage upon our arrival from Canada 3 days earlier- the baggage had not come off the carousel and the airline had told us it has simply been misplaced. It was delivered to our hotel 3 hours later with a note attached stating “This baggage has been seized searched due to security concerns” We had been profiled. Our complaint would later leave me bloodied in the middle of the isle. It turns out Northwest Airlines is the OFFICIAL airline carrier for McCain campaign and with U.S. Chamber of Commerce, amongst top 2 clientele for the McCain executive legal Council. CORPORATE GREED Incites Kidnapping/Murder Attempts Upon Our Family To Silence our Online Protest Against Northwest Airlines-the Official Airline Carrier for McCain Campaign, we the victims of a vicious Northwest Airlines profiling attack leaving me hospitalized family friends terrorized years thereafter via covert state persecution-AND Northwest amongst those Sued by ACLU for systemic bigotry/racism: McCain's Campaign TIES TO NORTHWEST AIRLINES (Official airline Carrier of McCain Campaign http://mccainsource.com/corruption?id=0006 and http://tpmcafe.talkingpointsmemo.com/talk/2008/08/northwest-airlines-supporting.php) at the Root of Murder attempts upon our lives. We have received email threats from FBI, and by way of phone, including threats from FBI agent Steven Davis referencing McCain as a “Very good friend of his” amidst repeated lawless no warrant, no charges attempts upon our persecution, kidnapping and murder here in Canada, attempts upon us beginning one year ago-the ear mark of the McCain campaign. However FBI Co-Intel Pro as seen in the documentary film,is still active today and targets political "dissidents" against governmenttyranny in the same stead it does Blacks, Muslims or activism. We have the 72 hour waiting period deemed "Ask Big Brother before You Fly" and the Murder of Carol-Anne Nephew of the Ombudsman of New York by Phoenix Airport police Oct 14/07, the Brutal death and murder of Robert Dziezenski a polish immigrant murdered upon his arrival by Vancouver police and many other egregious consequences as a result of these illegal covert racially charged agendas kindred with both Northwest Airlines and their corporate and political allies within McCain. Northwest Airlines has been sued in the past via ACLU, was in bankruptcy protection at the time of the attack, and is now not only in a delicate merger with Delta, but the official carrier of the McCain campaign. McCain well known for his *volatile temper (according to over 30 civilian and military sources)*Keating 5 Scandal, Investment savings and Loan, and his Exxon Oil 4.3 Billion tax relief initiative under the bailout. By lobbying against his airline, more pressure has been brought to bear on the sensitive Northwest Air Delta Airlines merger currently ongoing hanging precariously in the balance, the airline finally out of their state of bankruptcy protection, which prompted the original attack upon us in Jan 06- it was a retaliatory attack in response to our having filed a written complaint against the airline for lying to my mother and I about why our baggage had not come off the carousel, she and only to find we had been profiled, the baggage locks cut and searched through with a note appended to it as such. As a civil action against the airline still amidst bankruptcy protection at the time did not bode well for corporate interests at hand, retaliatory entrapment ensued and only after my mother and I had successfully passed through security and were already on board, did stewardess Sherrie Caudill accuse her of harboring a “suspicious bag” following which U.S. airport police boarded and an attack ensued. I had been assured I was not under arrest had not committed any crime and was not being charged- but could not return to Canada and would have to de board. Prompting them to simply give explanation of under what authority they were then acting, they did not respond and instead lit into me with a barrage of tasings and brutality leaving me bloodied in the isle, my mother looking on in horror, whereupon they then attempted to confine her to the plane when realizing in horror, that she was family as witness. Extensive extrajudicial persecution (framed, covert tribunal housing FBI and Northwest Airlines employees on an illegitimate “jury pool” (http://coverttrialthreatcollusion.blogspot.com/), threats, stalking, sabotaged mail etc) prompted us to expose their crimes on line. 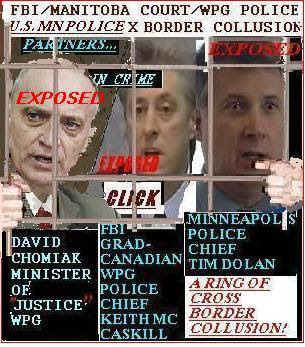 This spawned repeated attempts via cross border collusion towards our kidnapping or murder by *criminally charged local Canadian Winnipeg police (acting covertly without warrant or charges) on behalf of U.S. judicial and corporate factions including FBI CIA and NSA, in attempt to silence us. FBI Asset Winnipeg Police Chief Keith McCaskill: Local Canadian Winnipeg police remain motivated by a close affiliation with Minneapolis Police: Winnipeg Police Chief Keith Mc Caskill is president of North West Chapter of Associates FBI with Minneapolis Police affiliation and was referenced by police upon the first kidnapping/murder attempt. Family Friends Associates threatened, terrorized now 3 years ongoing as police use many covert tactics in order to effect attempts at kidnapping, having necessitated my going into hiding in remote locations for extended periods of time. Judicial Corruption is ongoing as Winnipeg police and Minister of Justice act jointly in stalling hearings to bide further time for kidnappings. Family and I have been traumatized, I with 12 trips to hospital with Heart Attack symptoms via combination of the effects of the tasing attack and ongoing persecution and my 64 year old mother's health rapidly deteriorating.